Experimental research shows that bigger portions lead people to eat more - doubling the portion leads to a 35% increase in consumption. The bias is pernicious, but you can take measures to avoid this problem. Serve yourself smaller portions. Don't go to all-you-can-eat buffets. Don't make your children eat everything on their plate. 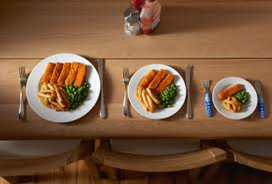 See Health check: do bigger portion sizes make you eat more?” at The Conversation for the full article. Do bigger portion sizes make you eat more? Do Bigger Portion Sizes Really Make You Eat More? See “Sizing Up the Effect of Portion Size on Consumption: A Meta-Analytic Review,” for the long-winded academic version.